Set in the soaring mountains and majestic valleys of southwest Montana, Wolves in Paradise is a tale of survival as ranchers face the challenge of living with wolves in the decade after the top predator was reintroduced to Yellowstone National Park. The documentary follows the growing wolf packs as they leave the sanctuary of the park and make their first incursions into Paradise Valley. "How can we have the rancher and the wolf together? That's the part we need to get figured out, all right. That's the tough one," says Paradise Valley rancher Martin Davis. Davis copes with the frustration of running livestock in wolf country, while fending off another threat to his way of life: encroaching development. His traditional, family outfit is contrasted with the vast Sun Ranch in nearby Madison Valley, operated as a conservation experiment that tries to accommodate both wolves and cattle with unexpected, dramatic results. Meanwhile, as the action plays out in the remote reaches of Greater Yellowstone, a surprising alliance grows between traditional enemies -- livestock growers and conservationists -- who find common ground in the need to protect open space from developers in this last, wild corner of the West. "While many ranchers continue to oppose wolf conservation, some of the most progressive ranchers are asking a new question. They wonder, 'How is it that we can best co-exist with wolves?' This presentation offers in-depth understanding about the complex perspectives and thoughts that progressive ranchers have about how to live with wolves. We learn about how these ranchers are succeeding and what challenges remain." "Wolves in Paradise presents a panorama of perspectives on wolves from ranchers and wolf recovery experts who live up close and personal with this top predator in the cattle country of Paradise, Wyoming. At the International Wolf Center in Ely, Minnesota, we use the film in our programs to spark discussion about human coexistence with wolves. 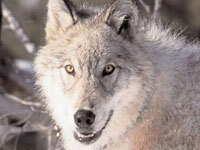 It portrays the wolf-rancher conflict with respect for both." "Like other modern environmental issues, this one has no easy solution, but as the film recounts the efforts of all sides to find common ground, a sense of optimism emerges. This film provides a fascinating look into one of our most contentious environmental issues of recent years, and shows how reasonable people can put aside their superficial differences and begin to tackle the biggest issue of our age--How can we continue to maintain wilderness values in a world that grows less wild every day?" "William Campbell's Wolves in Paradise presents a promising solution to a modern ecological problem found in some of the last remaining wilderness of the American West...Recommended." "The quality of this production is excellent...Trying to train wolves to keep them from attacking cattle and sheep is an extremely complex cooperative effort by Montana Fish, Wildlife and parks, the ranchers, and developers...This film is highly recommended for its balanced treatment of a very controversial subject." Predator biologist Elizabeth Hofer tracks and studies the elusive lynx in the Yukon's boreal forests. Coexisting with predators and protecting their habitats. The latest information about the behavior of grizzlies.